Cut down trees, build a basic house, wooden armor, bow, some fire arrows. Explore surface, mine materials you see, run from most of the enemies you come across, prepare to die a few times. Grab cactus if you come across a desert, you can use it to make a decent sword and armor. Try to get a pair of flippers from a chest at the bottom of the ocean (edge of the map). Use metals you mined to get an iron/lead pickaxe. Upgrade house and equipment with remaining metal. Start digging down to lava layer. Your goal is a complete set of gold/platinum equipment. 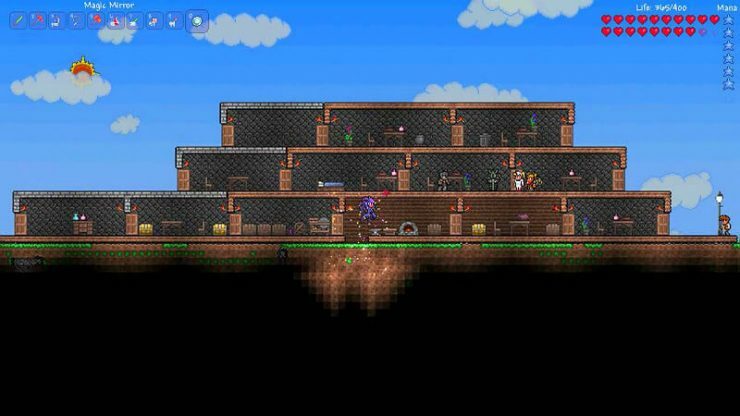 Expand house for more rooms and explore more caves for accessories or extra equipment. Be ready for first boss to appear at night. Kill boss. Build another room for dryad. Buy stack of purification powder or dynamite. Use powder or dynamite to break into corruption orb or crimson heart. Don’t break a third orb or heart yet. Wait for meteor to fall. Search map for meteor ore. Mine as much ore as you can (will hurt you to stand on it). Make a set of meteor armor, meteor hamaxe, phase blade, blaster. Beak the 3rd orb/heart. Kill boss that spawns. Make dark/crimson pickaxe, weapon, armor if melee. Make yoyo and fishing rod if you have extra. Break some more orbs/hearts till you have a gun, light source, magic thing. Be ready to fight boss again after every 3 breaks. Build walkway about half-way into sky and search for sky islands for treasure (there will be 3 of them that can have useful accessories). Go down to lava layer again, mine any obsidian that was made from water meeting lava. Make an obsidian skull to combine with boots of water walking, lucky horseshoe. You can now stand on meteor and hellstone ore. Mine out any new meteors that have fallen. Can sell excess ore.
Talk to guy outside dungeon at night. Bring your yoyo and health potions. Explore dungeon. Try to get some keys and fully explore the dungeon. Locate jungle on surface, search area below for treasure. Search other biomes you’ve come across for treasure. Dig into hell. Collect a hellforge from the buildings, collect hellstone ore. Make molten equipment. Build a straight walkway in hell leading all the way to the edge of the map (when in doubt, use ash blocks). Try to farm up a guide voodoo doll (carried by flying demons). Prepare for a hard boss fight. Throw voodoo doll into lava near edge of map while in hell. Open any crates you might have fished up. Make some basic equipment from any new metals you get. Use the hammer you got from boss to break 3 altars (don’t break any more). Go exploring again. New ores will appear in the ground. Prepare to die more often. Make a set of adamantine/titanium equipment. Make a mechanical eye. Fight a boss, Make a mechanical Worm. Fight a boss. Make a mechanical skull. Fight a boss. Craft new equipment from boss drops. Head to jungle. Break pod. Fight boss. Collect new ore. Make equipment from new ore.
Head to jungle temple. Explore jungle temple, make lizard power cell. Use power cell at altar in jungle temple. Fight boss. Prepare for the end, fight optional bosses and events. Collect any remaining items. Head to dungeon, fight cultist boss. Defear lunar pillars. Make new equipment. Kill lunar boss. 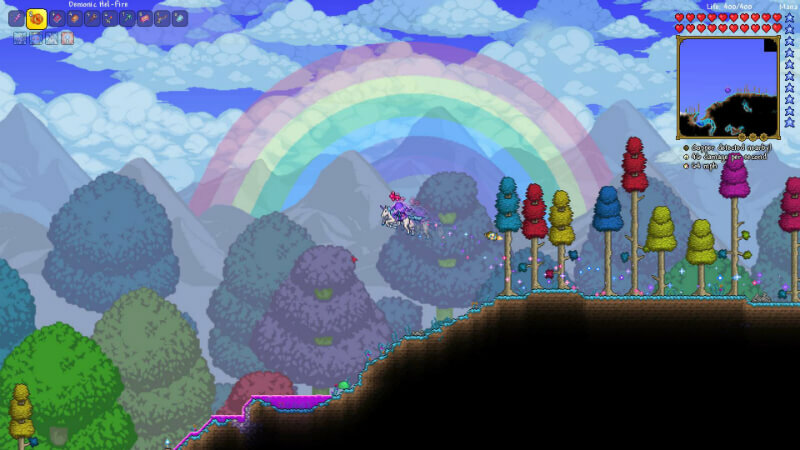 Depending on luck, frequency of deaths, how much extra farming you do by making new worlds for specific accessories, how much building you do, ect it should take you about 30-90 hours to complete all this from scratch. What new Tinkerer’s Workshop combinations would you like to see?